Have you ever had a weak Wi-Fi connection at some spots in your home or office? Naturally, everyone has had such moments and that’s why we’ve decided to present to your attention one way of enhancing the signal in question if you happen to live in a bigger house or work in a huge office. In the spotlight comes Tenda Nova MW6 – three compact, lightweight, and really cute cubes, emitting Wi-Fi signal. We know that many of you don’t have time to read longer publications and that’s why we’ve prepared a short review in which you can see the unboxing and some setup guidelines. We must mention, of course, the most important specs – this device can cover up to 500 m2 which is quite commendable if you have a big office or… a small mansion. Of course, coverage is as important as speed. Tenda Nova MW6 uses the 802.11ас standard and the supported speeds are 300Mbps at 2.4Ghz and 867Mbps at 5Ghz. In order for your phone to establish a connection with the cubes, it needs to feature Android 4.0+ or iOS 8+. The cubes are quite compact and relatively lightweight (410 g). Every cube has a separate power connector, and one of them is connected to your modem/router via a LAN cable. And the final step is to configure your system. Like we said, you need to connect one of the cubes to the power supply, and then use the LAN cable to plug it into your router. Next, you have to download the Tenda app. You will first have to use the default username and password (found on the bottom of each cube) and after that, the app will guide you through the process of configuring the remaining cubes. A pleasant addition is the available LED indicator that glows in three colors, depending on the quality of the signal – solid blue (great connection), solid yellow (good connection), and solid magenta (weak). Finally, the Tenda Nova MW6 boasts Wave2.0 MU-MIMO technology allowing for better connection when using multiple devices. 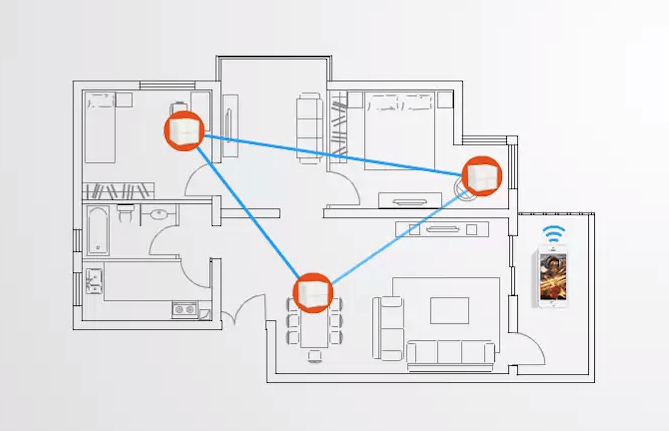 Also, there is a convenient roaming feature that prevents signal loss when going from one room to another.